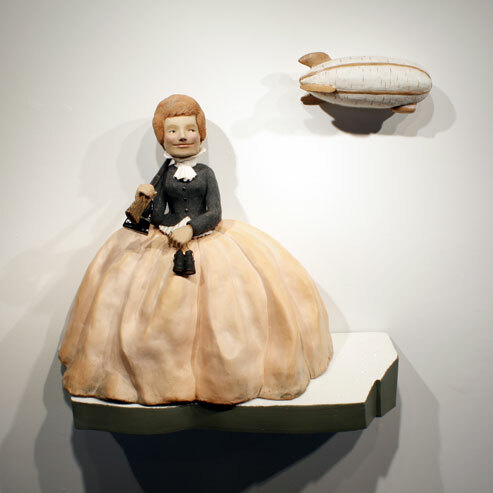 Red Lodge Clay Center brings together the work of Pattie Chalmers and Pavel Amromin in the January 2011 Loft Exhibition. Both artists present vignettes reflecting the consequences of the human condition; sometimes with a stark glare, sometimes in a silhouette of allusion, always sardonic commentary. Chalmers is an Assistant Professor at Southern Illinois University Carbondale. She exhibits nationally and in her native Canada. Amromin is an Adjunct Instructor at Gulf Coast Community College in Panama City, FL. He has been represented at SOFA eight years in a row in addition to having a strong national exhibition record. Both, are contemporary witness and interpretative recorder.